Profit margins have increased over the last 12 months due to the benign business environment, however, a slight decline cannot be ruled out in the future. In 2016 the French machinery sector recorded sales growth in most segments, driven by increased domestic demand (from the metals and construction industries) and rising exports. Machine tool sales increased 6.9%, while the lifting and handling materials segment even recorded an increase of 18%. This was triggered by rising exports and a turnaround after several years of subdued domestic business investments, mainly in the construction sector. However, as in 2015, machinery businesses related to agriculture/farming equipment continued to face a very competitive environment and decreasing sales and margins, mainly affecting smaller wholesalers. Sales continued to decrease in 2016 (down 2.6%) as farming equipment buyers reduced their investments further due to lower revenues. At the same time, the boiling equipment machinery segment recorded a decrease of 2.9% in sales, still impacted by low investments from the oil and gas industry. French machinery sales growth increased about 3% in H1 of 2017, mainly driven by overseas demand, especially from Asia and South America, and exports are expected to increase further in the coming months. At the same time, domestic demand remains robust, with an upbeat business climate and more French companies are willing to increase their investment in equipment and machinery. 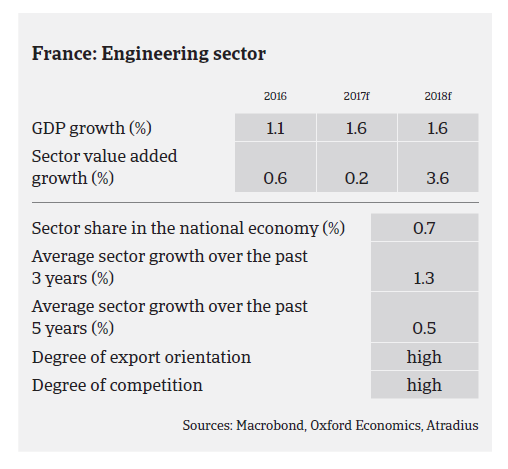 Real fixed investment in France is expected to grow above 2% annually in 2017 and 2018. In this capital intensive industry, financing needs are high. As a result, businesses in this sector can incur large debts that weaken their financial structure and overall solvency, putting undue stress on liquidity. However, in many cases advance payments can improve suppliers’ cash situations, while banks are willing to lend to the machinery sector. Profit margins have increased over the last 12 months due to the benign business environment and support by fiscal measures. However, in the coming 12 months a slight margin decline cannot be ruled out due to increased energy spending. 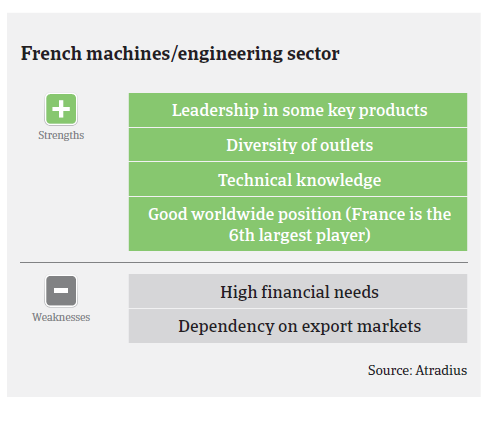 On average, payments in the French machinery sector take 70-80 days. The level of protracted payments has been low over the past two years. In H1 of 2017 non-payments decreased and are expected to level off in the coming six months. Despite a forecast decrease of 7% in French business insolvencies , in 2017 business failures in the machinery sector are expected to level off. This can be explained by the fact that the level of machinery insolvencies is already low compared to other industries. 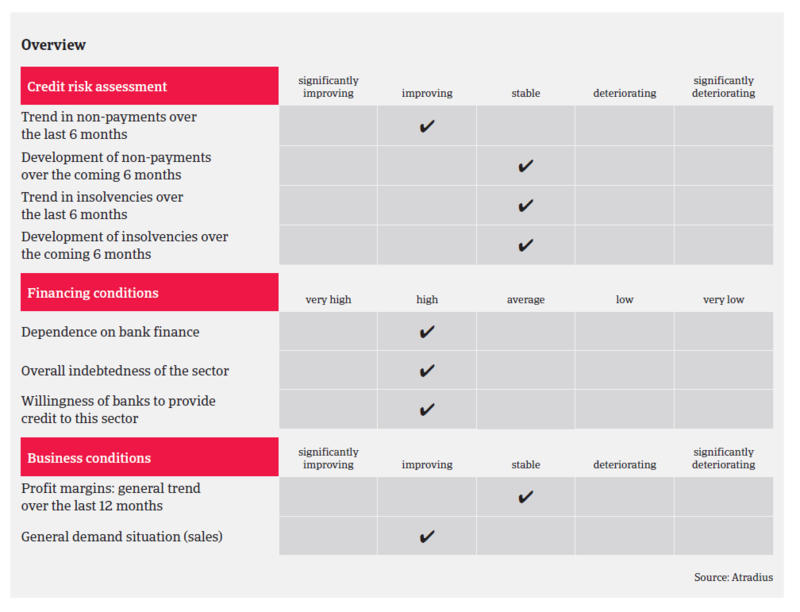 In view of the positive outlook, our underwriting stance remains open for most segments, however, we are still more cautious with machinery businesses related to the agriculture/farming segment due to the issues mentioned above. The same accounts for machinery businesses dependent on the oil and gas sector (like piping machinery). Automotive suppliers´ margins remain structurally under pressure, as the powerful car manufacturers demand greater productivity, coupled with lower prices.